Also read our session review. Now comes the formal ceremony of the wands or staffs. Each player takes his staff in his/her right hand and places the blunt end on the vacant white hexagon directly in front of his regent. The player with ‘white’ lowers his/her staff first, discretely pointing or touching the base of the other’s staff as a sign of modesty and friendship. Then he raises his staff again. This beau geste (magnanimous gesture) of white is now repeated by the other player. Next both players bend their staffs half way forward and touch to form a cross as a sign of solidarity and shake hands for the third time confirming their alliance and fidelity. Their game's rules are available online, and the game itself can also be bought for varying amounts of money, depending on how fancy you want it to be (from basic cardboard to an ultra-fancy ceramic board). It is claimed that all profits go to help Nepal, where the boards and pieces are produced. Metapontum is played on an 8x8 hexagonal board. Each side has 16 pieces, placed on the player's first two rows. 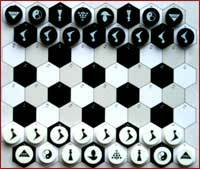 From bottom to top and left to right, the pieces are: the templar (who moves orthogonally, which on this hexagonal board means that it cannot get to its final position without help), the scientist (who moves one edge in any direction, always ending up on a square of the same color), the minister (who moves in all directions, including single edges, except orthogonally), the magister (who moves in all directions, including single edges), the regent (who moves anywhere one space at a time, and can swap positions with another piece of his own side once per game), and finally the pioneer, who plays the role of pawns in this game (they move one step in either forward direction, may move two steps on their first move, and get promoted to laureate, which moves like a magister). 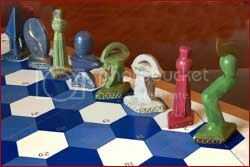 The objective of the game is to position one's pieces on the opposite side of the board: so it seems, at first glance, no different from the standard formula of making chess cooperative by giving it a mutual positional objective. However, Metapontum introduces many interesting cooperative mechanics. For instance, you may notice, if you look at the starting positions and the possible movements, that the game cannot be won without pieces helping each other. Metapontum implements this as the concept of exchange: two pieces, one from each player, can swap places instead of a movement, as long as both players agree. Another new mechanic is that of honor points, which are awarded to a player who swaps the other player's piece to its desired final position, gaining one honor point from such a move. 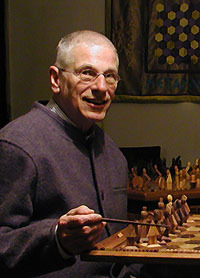 To win the game, both parties must execute the key move, for which they must have the same number of moves, honor points and laureates (promoted pioneers). So it seems that honor points are not used as a reward, but rather as a condition that must be balanced in order to win, which makes it sound rather less like a reward than the term might suggest. Wooden board and ceramic pieces. The rules are not exactly easy to follow, and I'm going to be honest here, I still don't quite understand them. For instance, I don't see why it's not possible for the two players to simply exchange all their pieces one by one in the correct position, making the game trivial. I may have missed something in the rules that prohibits this, but I poured over them many times to try to find my error and have not yet been successful (I have sent them an email query and will correct this when the explanation is given). There is a sample game provided, with the proper notation. In this sample game, half of the total moves are exchanges, and half are moves, so it seems that both aspects of the game are well balanced. The authors also say that a computer game version is on the way. Many variants are proposed, mostly variants on the starting and end positions, including one entirely random variant. The terms used are peculiar, but fitting to the "peace" theme. The referee is called a pacificator, games are called "peace games," a move that awards an honor point is called a "redemption move," pieces "realize" themselves, and we are invited to have a "pleasant, harmonious and balanced game encounter." One imagines dignified old diplomats with suits and suitcases sitting down to play a "peace game" while vigorously but politely discussing basic human rights issues. It's all very noble and dignified, and should probably be played on a ceramic board for the full world peace experience. Little jokes aside, I highly recommend taking a look at this game for a novel implementation of mechanics and interesting variants complementing a relatively simple positional objective. The quality of the game can be expressed in the degree of efficiency with which the players, caring for each other’s interest - reciprocity - arrive with a minimum of moves on the other side of the board according to the predetermined end-diagram. This can be a simple position exchange to that of the other party or it may be a totally different end position. However, one always tries to upgrade the order, playing from a lower or simpler to a higher or a more aesthetic position that is determined in advance by the players. Therefore the premium significance of Metapontum building a bridge to a better world, a society without violence. While chess is played in total silence and is strongly individualistic and directed to personal gain, with Metapontum the aim is just opposite, purposeful communication, idea-exchange and the thinking process is directed toward seeking solutions for common problems. If you have played it and want to submit a review, please email me. In order to exchange (trade) territory (sides), a white piece may exchange place with a black piece or vice versa but ONLY according to the prescribed power of the MOVING PIECE. Players must have equal moves etc., transferring their territory in an orderly, harmonious way, playing their pieces to the other side without rivalry or competing who is first. Game balance means harmony between players that play to become better friends, opening their minds and hearts to each other. At the end of the game both players must have equal number of moves, of elevations and honor points in redeeming the ally. All pieces must reach the new home base or end diagram the game objective. Players therefore win together by learning to communicate more effectively. politely without imposing ones (political) view or will on the other in order to reach true (populous) consensus, having mutuality by transcending rivalry, petty political party wrangling.